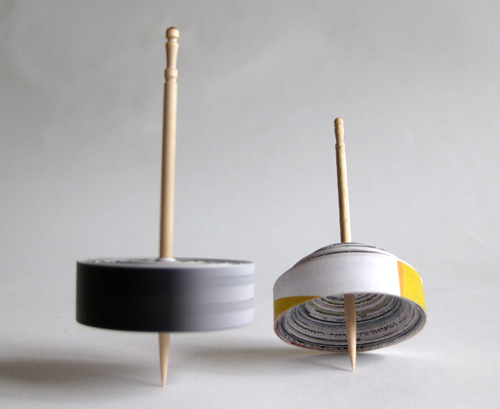 To make these paper tops you will need some old newspapers and toothpicks. 2. Glue ends of stripes to each other so you get one long stripe (in a nice messy pile). 3. 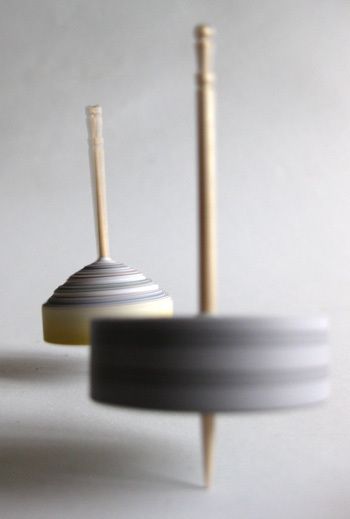 Glue the stripe to the toothpick and start wrapping. Make sure to tighten the paper every once in a while as much as you can. The tighter the better. 4. Once it is finished, you can adjust the shape to a cone if you wish. I love it! thanks for a great idea and how to! How fun is that! Brilliant! Ya te pongo en mi blogroll!!! this is wonderful. i love your fancy toothpicks. i'm going to have to see if i can find some. thank you for another wonderful idea! Here I will share some homemade toy ideas. If you make something inspired by one of these ideas, send me a photo and I will post it. Would be fun to see these ideas grow and change!